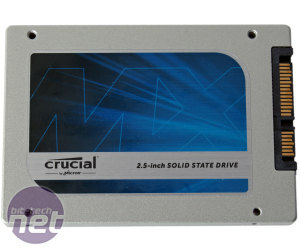 It wasn't long ago that Crucial launched its M550 SSD; in fact it was the last SSD review we did. While the focus of the M550 was mostly on performance, today sees the launch of the MX100, which is the actual direct replacement for the M500 and a drive which is aimed at more budget conscious buyers. 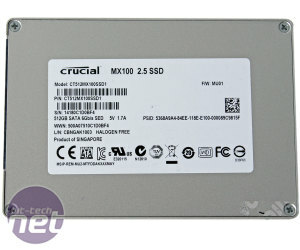 Recently, the M500 has fallen to some very low prices, so it's a tough act to follow, but impressive Crucial seems to be doing just that, as it's launching the MX100 at or around current M500 pricing – this top-of-the-line 512GB drive, for example, has official pricing of just £160, or just over 33p per formatted gigabyte. The MX100 will be available in 128GB and 256GB capacities too for £57 and £79 respectively. For now, the drives will only come in the 2.5-inch 7mm form factor, with no word on M.2 or mSATA versions. Aesthetically, the range is in line with previous offerings – a plain metal chassis with a blue and black sticker on the front, though in this case there's no mention of a product name. A spacer for 9mm 2.5-inch mounts is provided in the box along with a copy of Acronis True Image HD 2014. 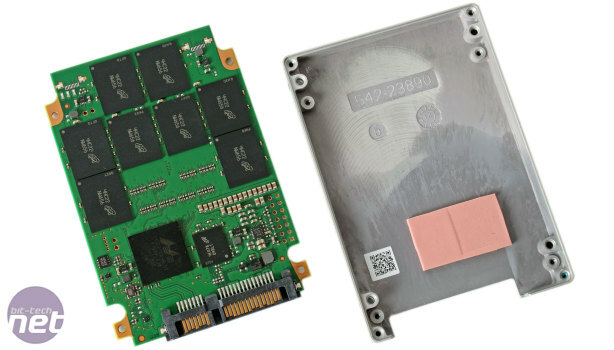 The main feature of the MX100 is the use of Micron's 16nm 128Gbit MLC NAND dies. Such density on such a low process node saves on a lot of space, and thus cost, hence the low pricing. 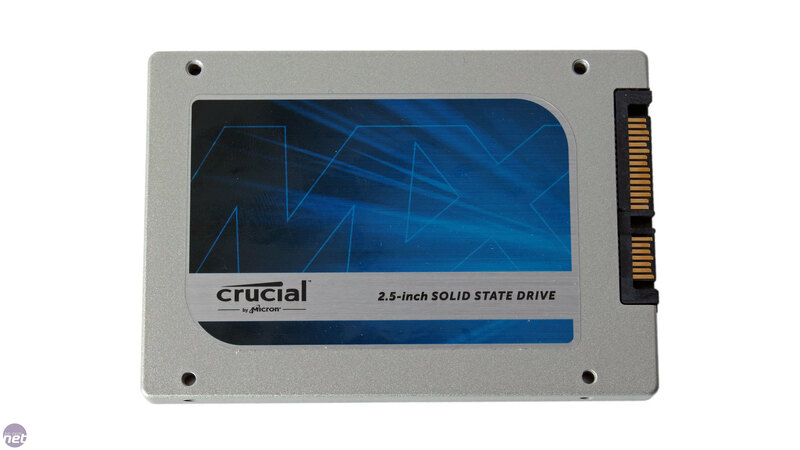 Crucial also claims that is has maintained endurance as well as performance in the move from the 20nm NAND, giving the MX100 the same high endurance rating of 72TB of total host writes. Without long term testing, this is hard to validate, but it's certainly an impressive feat if true. One consequence of using 128Gbit dies throughout the range is that performance decreases as capacity does. The 256GB drive has half as many dies associated with each channel on the controller as the 512GB, and the 128GB halves it again, and thus we see a reduction in write speeds as the controller channels become less and less saturated. 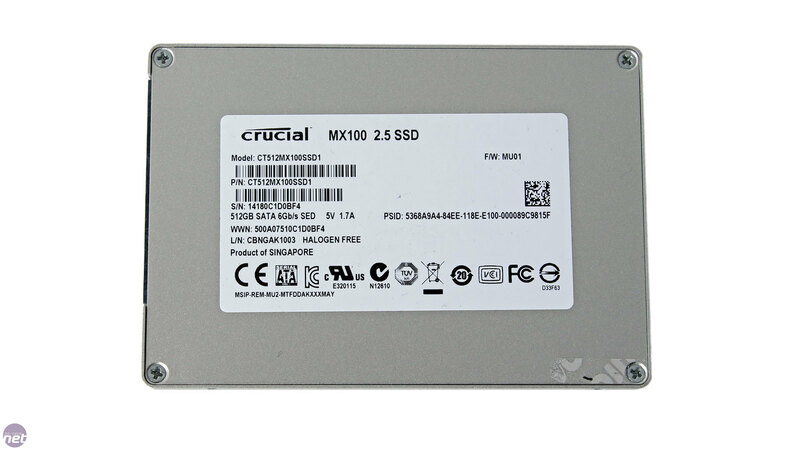 A more interesting effect, however, is that as the MX100 otherwise shares the same hardware and features as the M550 (we'll detail these in a minute), Crucial is effectively undercutting its own product at 512GB. At this capacity, both the MX100 and M550 use 32 128Gbit dies; four per controller channel. As a result even the officially quoted performance specifications are virtually identical, with only a 5,000 IOPS difference in 4K QD32 reads separating the two. This effect is unique to the 512GB drives, as in the lower capacity M550 SSDs Crucial switches to 64Gbit dies so as to boost controller saturation, but we're now unsure as to how the company plans to market its M550 512GB. 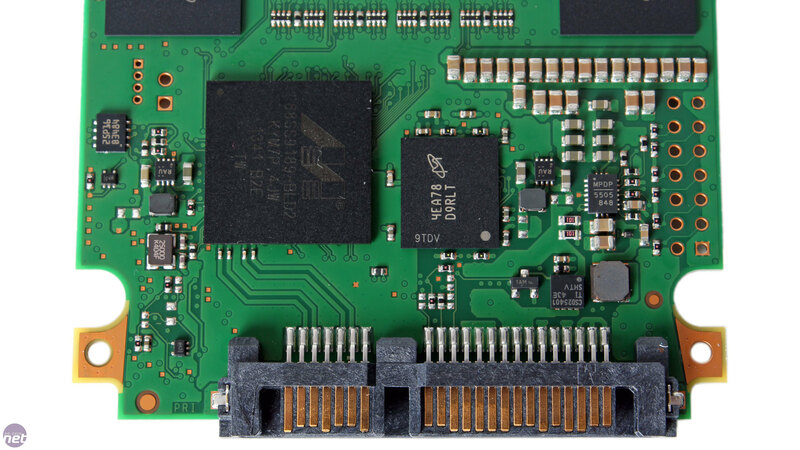 The MX100 uses the Marvell 9189 controller, which has a few minor upgrades with regards to performance and efficiency compared to the 9187 controller in the outgoing M500. The 9189 controller supports LPDDR memory, and indeed the MX100 512GB has a 512MB Micron LPDDR2 cache. 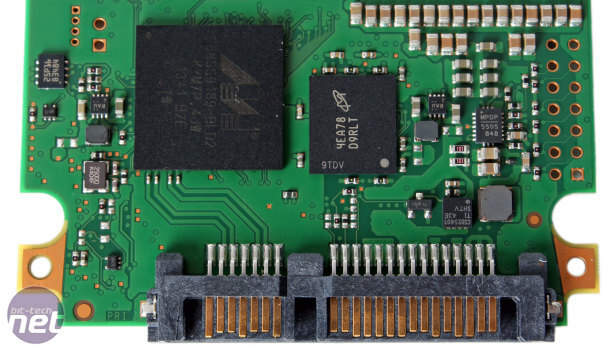 The PCB is a familiar sight, and in this 512GB version we have a total of 16 NAND packages (two dies per package), with eight situated on either side of the board. A sticky thermal pad covers the controller and cache and joins them to the metal chassis to aid heat dissipation. The MX100 also has adaptive thermal monitoring, which will throttle performance if the drive gets too hot until it cools down again. The array of capacitors just beside the controller and cache provide primitive power loss protection, and will power the drive just long enough so that it can flush any user data still in the volatile cache (only ever around 2-4MB according to Crucial) to the non-volatile NAND. Other functionality includes support for the ultra low power DEVSLP command, compliance with the TCG Opal 2.0/IEEE 1667 encryption standards (as well as AES 256-bit encryption, of course) and RAIN (Redundant Array of Independent NAND), the implementation of which is unchanged from that of the M550. If you're unsure as to what RAIN is, we explain it more in our M550 review. As we've said before, it's a very well rounded feature set, so Crucial's ability to bring it to even lower price points is very welcome indeed.